Should you limit your property search based on square footage? When a client is in our office and starts to tell me they need a certain square footage (say, 600sf) the first question I'll ask them is "how many square feet do you think think room is?" and I will point to the front room of our office. This room has a bay window, and some bump outs and closets that cover what used to be an old fireplace. There are some odd angles for sure, but most people end up over-estimating their perception of the square footage. Most answers are between 400sf and 500sf, when in reality the room is approximately 260sf. This experiment tells us that most people have difficulty perceiving how many square feet a room is, so when you limit your square footage requirements you might be excluding properties in your search that could very well work for your needs. In other words you may think that you need 600sf, when in reality what you are picturing in your head may only be 400sf or 500sf, so why pay for extra square footage that you don't need? 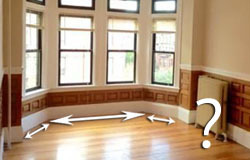 Another problem that often comes up when measuring square footage is odd angles. Truth be told most people (unless you are a math major) have difficulty measuring odd angles such as bay windows, nooks, curved walls, etc. Because we don't usually have a protractor on us at all times we often estimate these areas, and as you can tell from the previously mentioned experiment sometimes these estimates come in too high or too low which can skew the actual square footage. Again, we think it's best to not limit your search to a filter that could be estimated in the first place. When it comes time to look for a condo unit often times agents will advertise the property using the square footage they pull from public records, which may or may not be accurate...especially in a brownstone. Because of the odd angle factor and the reality that most brownstone condos were once single family homes that were "cut up" into condos, often times the square footage recorded in public records can be inaccurate. Finally, there are also other types of spaces that are often not included in a square footage measurement: partially finished basements, lofts, breezeways, 3 season rooms, outdoor space, etc. All of these types of spaces can easily make a property feel larger and extend the boundaries of the living space, but are often not included in square footage.